Naked God provides an opportunity to ask awkward questions, sift through the evidence and get to the truth about God. Is there a God? And perhaps, more to the point, if there is a God, what real difference will it make to my life? These are the most basic and universal of questions, and yet we don't usually take much time to think about them. 'In his famous book and TV series, The Naked Chef, it wasn't Jamie Oliver who was naked; it was the food. Jamie Oliver succeeded in stripping down the food to its bare but glorious essentials. 8. Isn't Jesus just a good moral teacher? 10. Didn't Jesus just die tragically young? I have just finished reading Martin Ayers' book. It is a great evangelistic 'give-away'. It is divided into three parts. In the first part, Martin shows the implications and paucity of atheism and relativism. He interacts with Dawkins and others in a helpful way. In the second half, he asks us to consider Christ. There are excellent apologetics for the historicity of the New Testament documents and miracles in this section. Martin asks us to consider Christ's teaching, death and resurrection. The final section is about responding to Jesus. Repentance and faith are clearly and helpfully spelt out. When I was being urged to write A Fresh Start, I said to my friends, "There are plenty of evangelistic books available", to which they replied, "I have given those to my friends—I need a new one". This book offers us yet another chance to help our friends understand Jesus. Get a copy and see if this is what your friends need. I think it's a winner. I think Martin has done a terrific job of clearing away unnecessary objections to the faith and then explaining what that faith really is and entails. The style is simple, warm and engaging. I also love that I can hear both the lawyer and the evangelist. The arguments are clear and concise and the call to accept Jesus as Lord and Saviour is genuine. I was amazed, actually, how such a short book could feel so comprehensive. I wish I had written it. Challenging, enjoyable and biblically faithful. 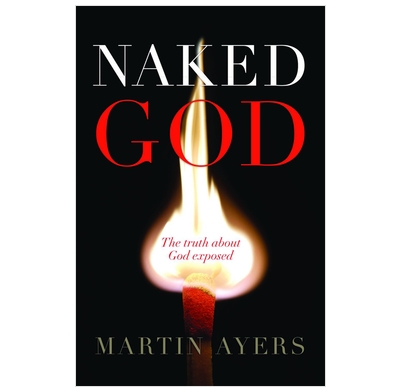 I'm delighted that Naked God invites its readers to examine the naked truth behind their own beliefs, then moves on to a compelling and persuasive explanation of the person and work of Jesus Christ. this is a book to give to interested but unsaved friends. it's just a little bit heavy at the beginning but thereafter, clear and very readable. This is a great book for your "thinking" non-Christian. Gently, but clearly and logically Martin Ayers demonstrates the flaws in the main arguments raised today first against the existence of God and then against the trustworthiness of the person and message of Christ. The reader is challenged to take an unbiased, humble and honest look at the evidence on which the Christian faith is founded. I appreciated the lack of reasoning "why there must be a God" (an argument no one will win). Rather, by setting forth Jesus plainly, the choice is there for us all to make. I can think of a few friends I will seek to give this to, and will certainly ensure it's available in our church so others might be similarly equipped / intrigued.